I find myself tonight on the couch with computer in hand, drinking a beer, and watching the New Orleans Saints kick off the season and begin their defense of the title (Two Dat!). Having been recently reminded by The Aimless Chef of Mr. Smokeypant's live drunk blogging of a Houston Astros game, this seems like a great occasion to live blog another event. I'm not new to the live blogging scene, I once chronicled a homebrewing session. I also live blog football games from time to time for my Pick'em league that most of you guys forgot to sign up for. Being that we loosely define ourselves as a drinking blog, instead of giving you my thoughts on Brett Farve's march to The Super Bowl a season with more INTs than TDs, I'm going to cover an even bigger event. Tonight is the first-ever Virtual Colorado Beer Tasting, brought to us by the organizers of the upcoming November 5th-7th Beer Bloggers Conference. Agenda Items: - A retrospective on the importance of the future of beer blogging, -Ethics? Oh I thought you said Epics! Being that this is a virtual event, I won't really be live blogging my tasting extravaganza, I'll be live blogging the whole virtual experience... at least as it unfolds on Twitter. Buy some Colorado beer. If you already have some Colorado beer, skip this step. At 7:30 PM MST, open up said Colorado beer. Do some combination of sniffing, tasting, staring, swishing, quaffing, listening, feeling, and sixth sensing the beer. THE MOST IMPORTANT STEP: Tweet about your Colorado beer using the hashtag #bbc10 (unfortunately not #fevcbt or even better #vcbt10... but I wasn't asked to organize this event). If you are part of the Twitter revolution, then be sure to follow @beerbloggers for information on the conference. If you are new to Twitter, you are hopping on just moments before Microsoft or Google has figures out how to squash it. However, Twitter is currently still the absolute best way to catch random breaking news, see pictures of flowers, find out who 50 Cent wants to murder today, and learn how everyone feels after their workout. Just a little administrative item before I get started, I live in the Central Time Zone, which means I look at the Chicago clock, which means if you don't then you'll have to do the appropriate math to decode my time logs below. - "What is everyone drinking tonight for #bbc10?" - "Getting excited for #bbc10"
- "RT: What is everyone drinking tonight for #bbc10?" NFL kickoff is almost upon us. Damn, I'm so old I saw Dave Matthews in New Orleans 15 years ago. The Saints are winning... college football is on... Cheers! let's get crackin' with this virtual tasting event. Ronnie Crocker, a beer blogger for the local paper , reps my city with a tweet. H-town represent. I spy a shopping cart. Not thirsy yet? 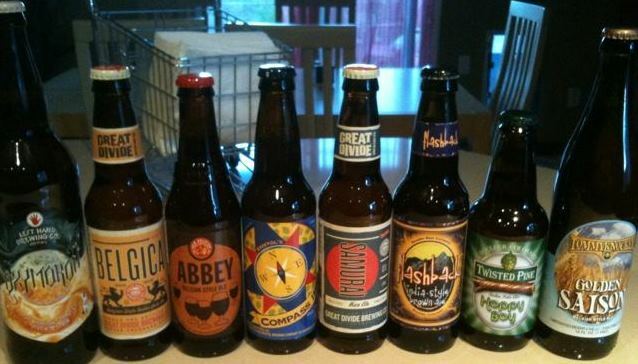 @monkeygurly tweets her potential lineup for tonight and chooses the Great Divide Samurai first. By the way, did @monkeygurly steal a shopping cart from the liquor store? Ladies, @kylefree is on a boat and likes spicy french fries, but he is not on the boat you would expect him to be on. You might as well @ him if you would like to get on board. Seriously Toyota? The Tiny Football League. What a *huge* disappointment. I'm just saying, I was hoping for midg-- er, the little people. By this blogger's count, @TheBeerWench registers the first #bbc10 "OMG"
@TheBeerWench: Sipping on @OdellBrewing Woodcut Reserve #4 for #bbc10 OMG this is remarkable! All this Colorado talk reminds me of Crawford's Denver story in his 2010 Anything Mock Draught pick where he recounted a visit to the "Wynpoop." Man, that guy is a real @$$hole. Brilliant pick though. Whoa, @roadtrips4beer is WAY too familiar with the taste of a urine sample... possibly also has other medical problems that have impaired sight... goes to bed 10 minutes later. Sold! I'm going to get one out of the fridge. I just bought a sixer today and haven't tried it yet. Best tweet of the night IMHO. Wow, we've hit a bit of a conversation flat-line on Twitter. How about some stats for the night? Since I haven't talked any beer yet... At this point in the night, I'm sipping a New Belgium Hoptober Golden Ale. I'd tell you what I thought, but this post is totally not all about me. ... tastes better THAN I WOULD IMAGINE A URINE SAMPLE WOULD TASTE. I've never drunk a urine sample ... that I know of. And no sight-impairing medical condition, other than nearsightedness, for which I wear glasses. I was just hammered. I mean, c'mon, an NFL game and a live beer-twinking event at the same time? Just joshing, man. We follow your tweets here anyway, but your comments last night were above the fold material... at least in realm of live blogging a twitter event. Is that front-page above the fold or business-section above the fold? I don't think I've ever conducted anything that could be mistaken for "business" on this site. I have, however, contributed during business hours. So in the fast paced Twitter world, where data junk is old in 10 minutes, this was front page above the fold for that particular moment in my life. But of course now that it has been published in a blog, it has been, like, immortalized.